Makeup, Beauty and More: ZOYA - 3 Free Nail Polishes Of Your Choice Promo Starts Monday! 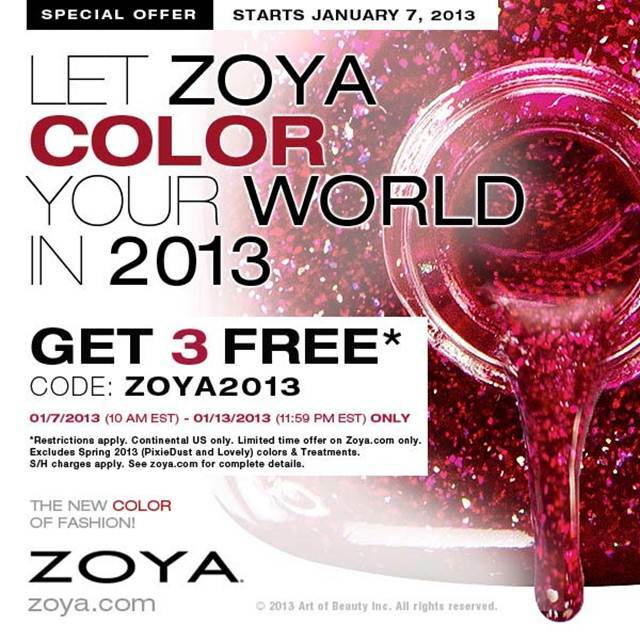 ZOYA - 3 Free Nail Polishes Of Your Choice Promo Starts Monday! ZOYA is back with their fabulous 3 free nail polishes promo!! Details Below! I'll try to to do swatches of some of my favorite polishes from ZOYA before the promo starts. Zoya Nail Polish wants you to SHINE in 2013 by rocking your unique style - on your nails! Pick any 3* Zoya Professional Lacquer shades to instantly update your nail polish wardrobe for the New Year! Offer Valid Monday, January 7th (10AM EST) through 11:59 PM EST January 13th ONLY Pick 3 bottles of Zoya Nail Polish for FREE* ** just pay shipping & processing charges of $10. Create an account on Zoya.com if you do not already have one.. Add at least (3) Zoya Nail Polish shades to your shopping cart, along with any additional items you wish to purchase.